Flooding has been Jakarta most problematic issue since 1600 years ago. Prasasti Tugu (Tugu Inscription) is the witness from Kingdom of Tarumanagara in the past. The inscription was found Kampung Batutumbuh , Kelurahan Tugu Selatan, Koja, Jakarta Utara. Inscriptions that made ​​around 403 AD tells story about the digging of a canal or river Candrabhaga (Bekasi ) and Gomati River by King Purnawarman . The 11 km long canal is intended to manage the flood, as well as to hold water during the summer. Governor General Jan Pieterszoon Coen, dreamed that Batavia was to become a duplicate of Amsterdam. No wonder if Simon Stevin designing the layout of Batavia in 1620 was made to resemble Amsterdam. But the effort was not easy to design a port city that is often flooded. Batavia was built on the ruins of the Jayakarta made ​​with lots of ditches and canals and flood can be engineered into the potential water urban transportation. Ciliwung River that winding was overhauled and made ​​straight into the great river and the canal which divides Batavia into two. No wonder if at that time, Batavia was known as the Queen of the East. However, Batavia also is not immune from flooding. The first major flood in Jakarta as recorded by history in was happened in 1621, then 1654, 1872, 1876, and 1878. Flood in 1872, for instance, inundating Jl. Pintu Besar, inundating Glodok area so paralyzing commercial activities. In 1878, rain continuously fell down for 40 days and resulted flood in almost the entire area of ​​Batavia and Omelanden (buffer zone) and the canal system in Batavia is considered failing to minimize flood. On 1 January 1892, the rain in Batavia reached 286 millimeters which resulted in several areas around Weltevreden flooded and damaged roads around it. Flood did not just happen in downtown of Batavia, but also experienced in the suburbs including Pasar Minggu. One reason is because the Governor General Daendels (1808-1811) destroyed the walls of the fortress / castle of Batavia and buried canals by using the material from walls of Batavia. And the remaining canals were shallow due to the deposition. 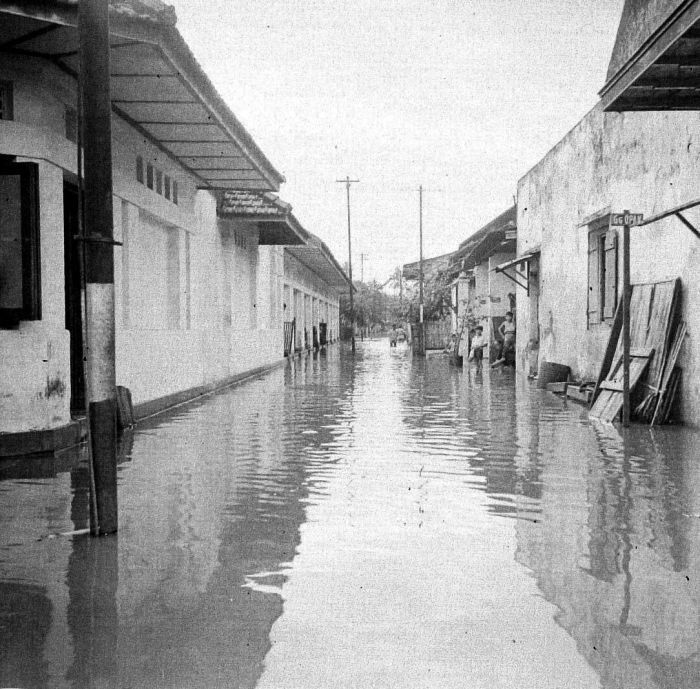 When the Dutch East Indies government built Menteng (1905-1940) as an elite area for the Europeans, flood has been a problem of Jakarta and that flooded areas such as Senen, Tanah Abang, Subang, Tanahtinggi, Kemayoran, Pasar Baru, and others. Finally in 1913, with funding support 2 million guilders, the Dutch East Indies government decided to build a canal from Manggarai to Muara Angke, now known as the West Canal. However, the Dutch East Indies government basically just building a canal to protect the interests of Erupeans people from flood and not to protect the citizens of Jakarta as a whole. However, the construction of West Canal which designed by ​​Van Breen in 1920 was not finished yet until the Dutch go. While the City Canal Ring polder systems in a number of areas floodwaters have not awakened and Batavia sunk back in 1932. And the flood is still just inundated Jakarta even after Indonesia’s independence. 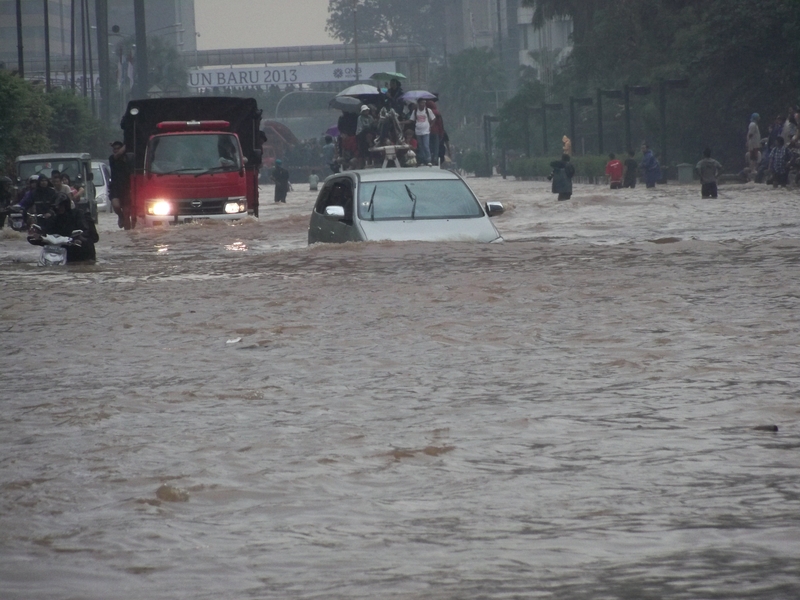 Great flood was recorded occurred in Jakarta in 1976, 1984, 1994, 1996, 1997, 1999, 2002, 2007, 2008, 2013, and 2014. Not surprisingly if the slogan of Batavia at that time was “Dispereert niet ” which means do not despair , including a flood that will continue to accompany the citizens of the Capital. Hello, I’m doing some research on flooding in Jakarta. May I ask where you got your information about past flood dates in Jakarta? Thanks! I am also doing some research on flooding in Jakarta, can you please send me the source of information too ?